Hundreds of Occupy Wall Street protestors filled Zuccotti Park on Saturday to celebrate the first six months of the movement. The action began midday, and included marches by groups of protestors around nearby streets in the Financial District. 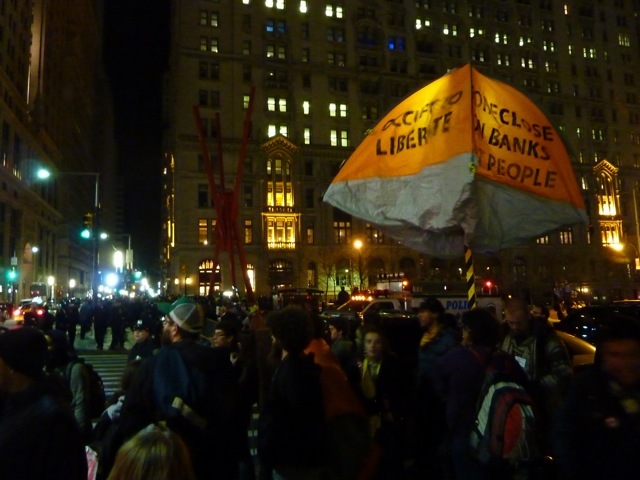 By 10 PM the crowd in Zuccotti–also known as Liberty Park–had swelled to over 700 (some reports go as high as 1,000). The mood in the park was light and celebratory when the sounds of bagpipes were heard, approaching from the west. Hundreds in the park moved toward the noise, only to witness NYPD officers preventing the pipers from entering the park, arresting at least one. Some on the scene said that the pipers were not affiliated with OWS; they had come to NYC from Brittany to participate in the St. Patrick’s Day parade, and later decided to play for occupiers. While the pipers had drawn much of the crowd to the southwestern part of the park, uniformed NYPD officers moved in to remove a makeshift tent (a plastic tarp thrown over a rope strung between two trees). As police were doing this, loud shouts of “get out” were heard. That order came from a blue-shirted community affairs officer, though, and was not directed at protestors but at the uniformed cops that had just moved in to remove the tarp. Those officers complied and filed quickly toward the east side of the park. Shortly after that, however, dozens more uniformed NYPD moved into position around the park, and at around 11:30 PM entered the park en masse. Though no announcement was audible on the east side of Zuccotti, reports say police told protestors the park was being closed for “cleaning.” While many occupiers moved out of the park, a large number remained, some linking arms, others behind orange netting recognizable as the material police have used to “kettle” protestors in the past. At that point, police began grabbing protestors and placing them in plastic cuffs. Some were escorted out of the park to waiting wagons on Broadway. Other occupiers lay down or went limp and had to be carried out of the park. But other protestors encountered a more violent response. Accounts include reports of a broken thumb, possible broken jaw, and police using their boots to hold protestors’ faces on the ground. Others said they were pushed forcefully down the street; one visitor to the park reported being hit from behind with a nightstick. The NYPD quickly filled the two wagons they had waiting at the scene. Police cleared a swath of sidewalk on the east side of the park and constructed a pen out of metal barricades to hold other arrestees until more transport arrived. Some of those protestors were face-down on the ground, others were standing; some were held by police. An MTA city bus labeled “out of service” arrived, and police began loading it with cuffed occupiers. Some were escorted easily onto the bus, but others were moved more aggressively. Multiple officers were seen holding down one arrestee inside the bus. One woman, wearing a bright yellow shirt, was moved forcibly onto the bus, only to be moved off of it minutes later. The woman was jerking wildly and appeared to be having a seizure. She fell or was forced to the ground within feet of leaving the bus. Some close to the scene said they saw police holding her down with knees on her torso. Members of the crowd shouted at cops to get her medical attention. Nothing happened immediately; it was about 20 or 30 minutes later that a Fire Department EMT and ambulance arrived on the scene. As police were clearing Zuccotti, a group of 100 or more mobilized to march up Broadway, announcing their destination was Union Square Park. Dozens of NYPD followed in squad cars, vans, on scooters and on foot–stopping marchers at several intersections, occasionally warning them to stay on the sidewalk. It is now reported that near 10th street, at around 12:20 AM, police became more violent, punching one marcher in the face, slamming him against a glass door, breaking the glass and drawing blood. This first video begins as cuffed occupiers are walked or dragged out of Zuccotti Park and onto waiting police wagons. The two wagons are quickly filled and their doors closed. Remaining arrestees are made to wait in the street, and then inside a hastily constructed pen of metal barricades. About ten minutes later, a city bus arrives to transport the remaining arrestees. At about 33 seconds in, a woman with red hair and a bright yellow shirt is briefly seen being led inside the bus. Approximately one minute later, the same woman is visible, but this time is jerking uncontrollably as she is pulled off the bus. Once off, she either falls or is brought to the ground by the police restraining her. When I heard Jean Quan offhandedly drop that she was on a multi-mayor conference call during a BBC interview, I knew I had heard something of note. The rapid succession of similar crackdowns on Occupy encampments in several US cities seemed like more than a coincidence, and so it was kind of a smoking gun. . . .
Well, not really a smoking gun–there wasn’t quite enough there and it, quite frankly, wasn’t all that surprising. In fact, it was kind of “duh”–not that it wasn’t good to have suspicions confirmed, but the OMG for OWS would probably be to find out that no one was colluding or coordinating to take it out. But that shouldn’t be the way I feel. I want to be more shocked that a variety of government agencies are working to undermine a needed, peaceful and long-overdue broad-based national movement, but after 9/11, the ramp up of the national security state as good as mandates this level of government intrusion. I am still looking for more on this (as are many others)–how many calls were there? who was on them? what was said? to what extent were federal agencies involved? did they advise or drive the conversation?–so this was more like a loose thread than a smoking gun. And the more we all pull that thread, I wonder, will it be more of a confirmation or a revelation–and most importantly, what will I mean to the Occupy movement? The Party Line – October 14, 2011: Will Occupy Wall Street Affect New York Politics? As I walked down to Zuccotti Park/Liberty Square in the predawn hours of October 14, I could hear “the people’s mic” and the people’s resounding cheers over three blocks away. . . but the biggest cheer came soon after I wedged my way into the park. . . .